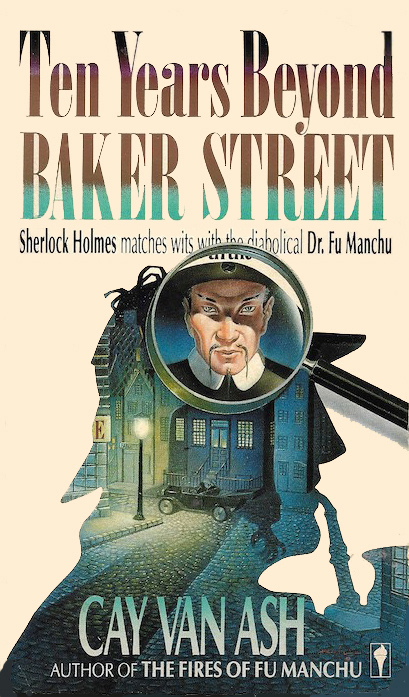 Sherlock Holmes faces off with the Professor Moriarty of the Far East, the diabolical Dr. Fu Manchu! First published in 1984. This is the 1988 U.S. paperback edition. It was ten years beyond Baker Street. The great detective was living in restless retirement among his bees in the wilds of Sussex. But an old warhorse will ever thrill to the trumpet of battle, and when a distraught Dr. Petrie begged his help to rescue Nayland Smith from the clutches of the fiendish Dr. Fu Manchu, Holmes, though reluctant, could not resist. When the sinister Oriental's evil minions unleashed their vile devices against the great man himself, the issue became more clear-cut. Though the stakes may have includied not simply the survival of Nayland Smith but that of the Empire itself, the stark facts ws that the game was toi be played by two geniuses for good and ill in a battle for a very personal supremacy.